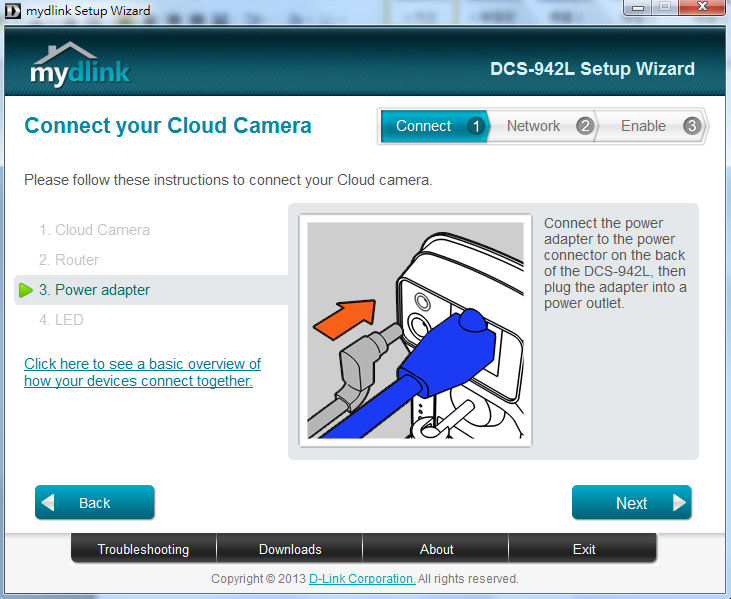 How do I set up and install my DCS-942L? 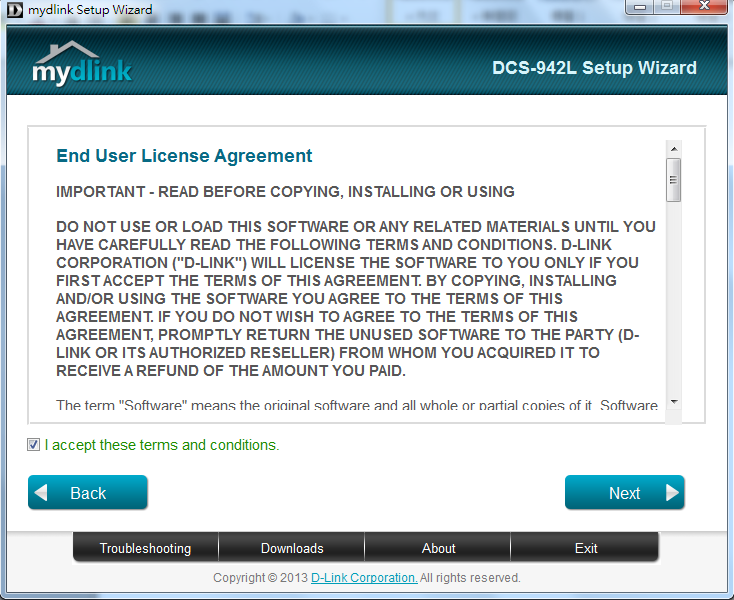 How do I set up and install my DCS‑942L? Step 2.1 : Select a language from the drop-down menu and click Start. 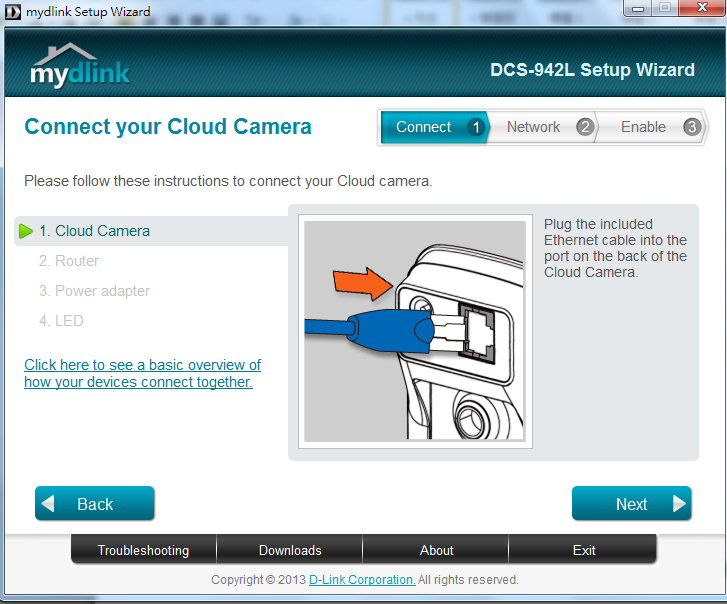 Step 2.3: Follow the on-screen instructions to connect your camera to your router and connect the power. Click Next after you have completed each step. 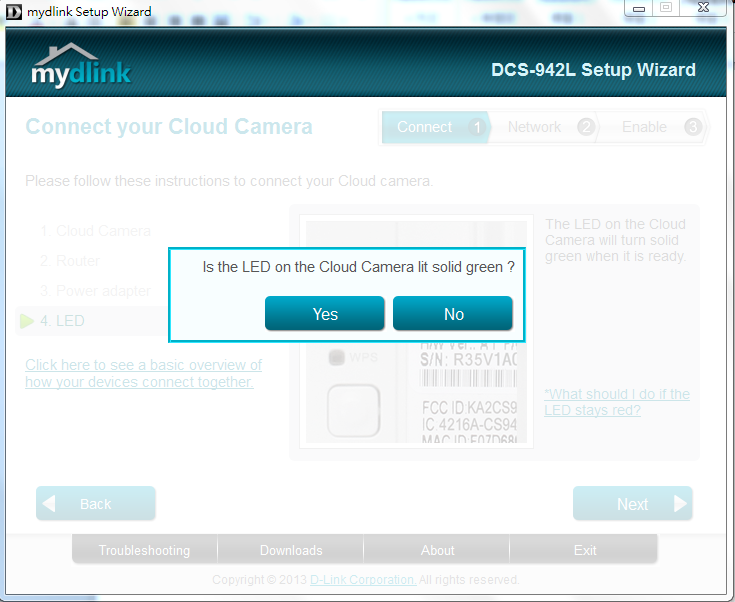 Step 3: Confirm that the LED on the rear of the camera is lit solid green. 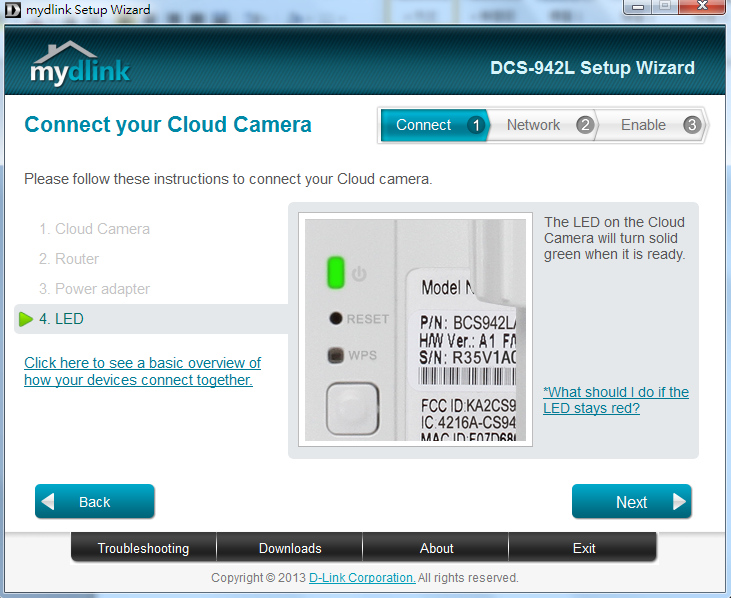 Step 4: Select your DCS-942L using the radio button from the menu on the left-hand side of the camera name. Enter and confirm a new password for the administrator account in the fields provided. 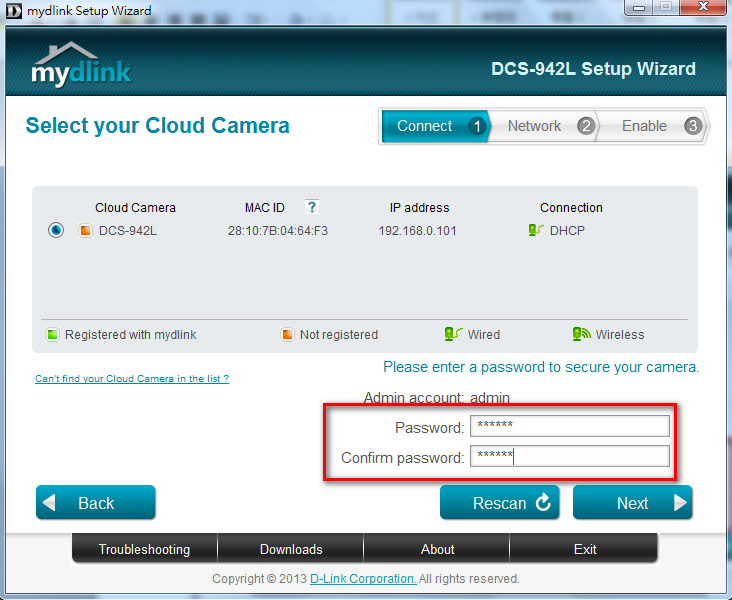 This password will be required when logging in to the camera’s web-based configuration interface. Click Next to continue. 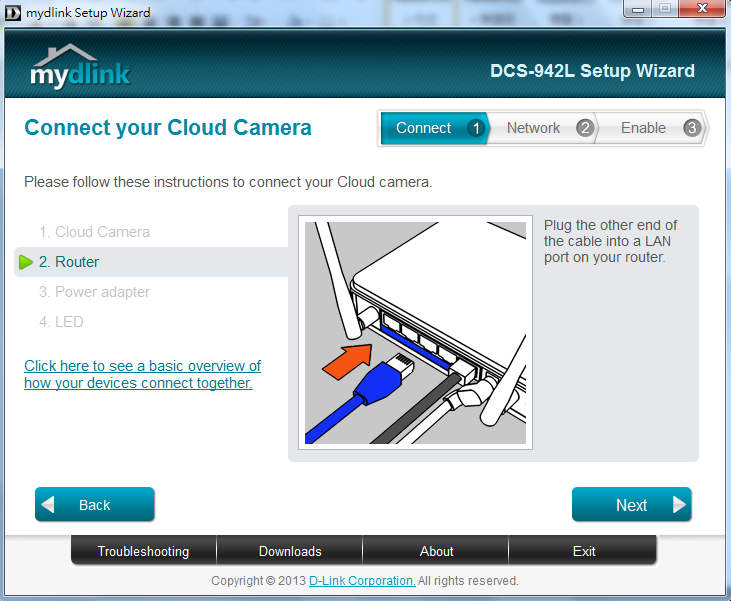 Step 5 (Wired conneciton): Using the radio buttons, select how you wish to connect your camera to your router for normal operation. 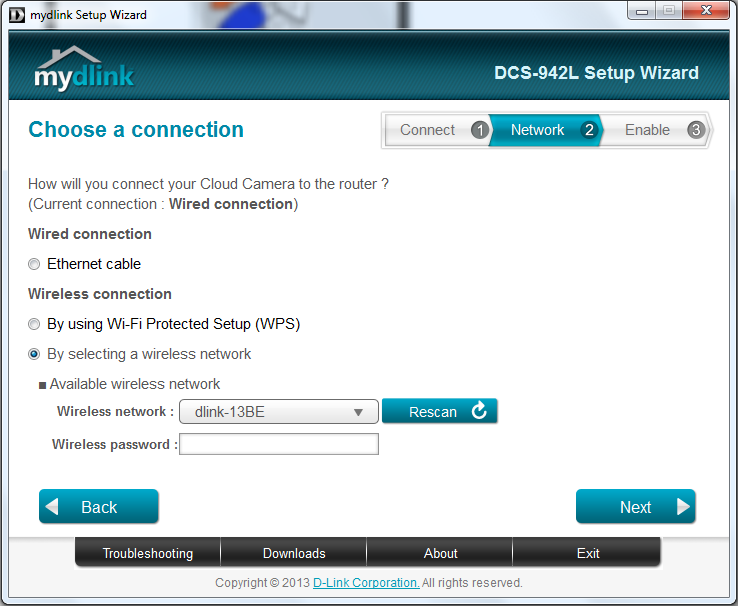 You can choose to connect using a wired Ethernet connection (Ethernet cable), using Wi-Fi Protected Setup (WPS), or by selecting an available wireless network. Click Next to continue. 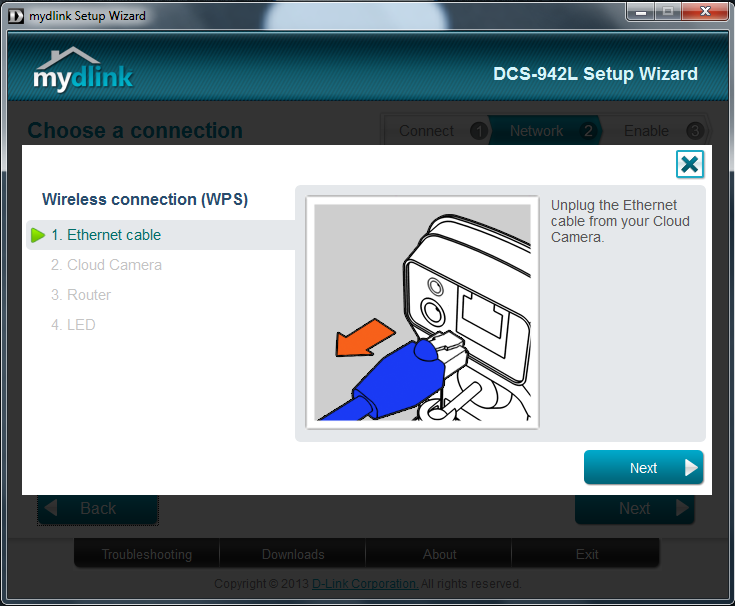 If you selected Ethernet Cable connection, follow the on-screen instructions to connect your camera to your router using a wired connection. Once completed, click Next to continue the wizard. 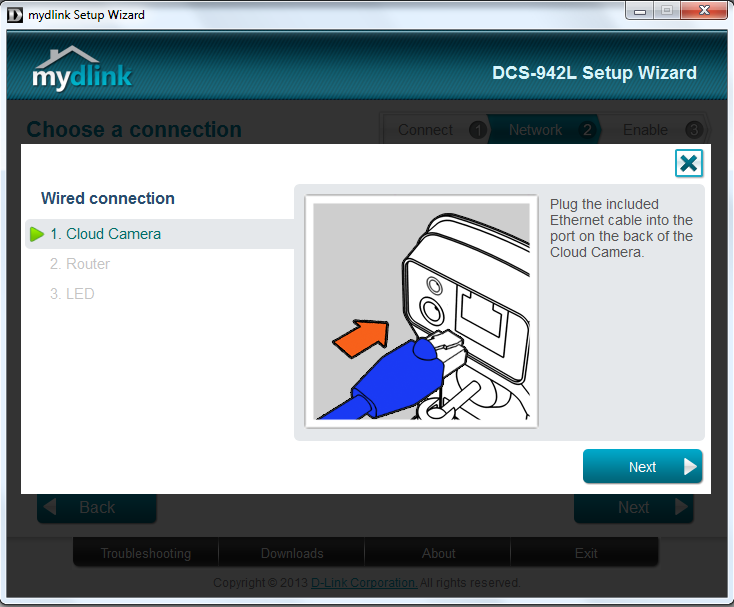 Step 6 (WPS): If you selected By using Wi-Fi Protected Setup (WPS), follow the on-screen instructions to connect your camera to your wireless router using WPS. Once completed, click Next to continue the wizard. Note: Your router must support WPS Push-button Connection (PBC) in order to use this method. 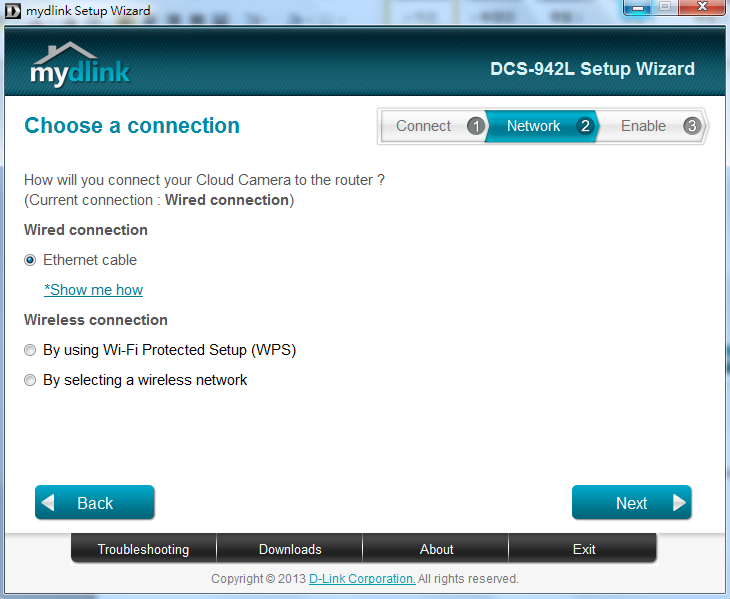 Step 7 (By selecting Wireless Network): If you selected By Selecting a Wireless Network, choose an available wireless network from the drop-down menu. 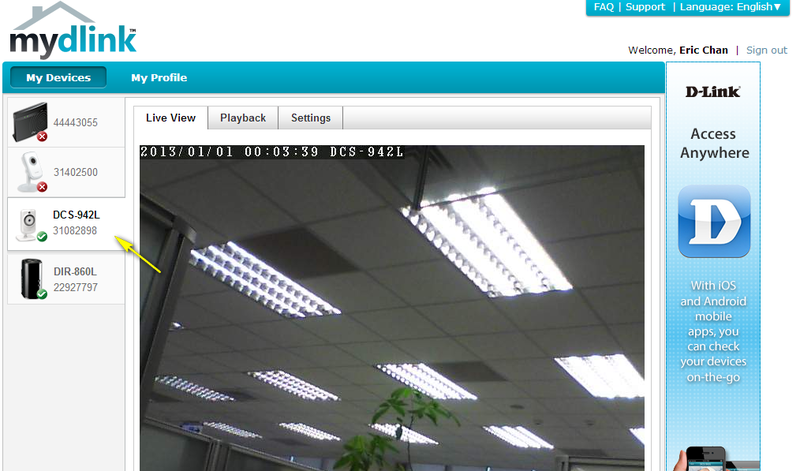 If you do not see your wireless network in the list, click Rescan to search for wireless networks again. If your network requires a password, enter it in the Wireless password field. Click Next to continue. 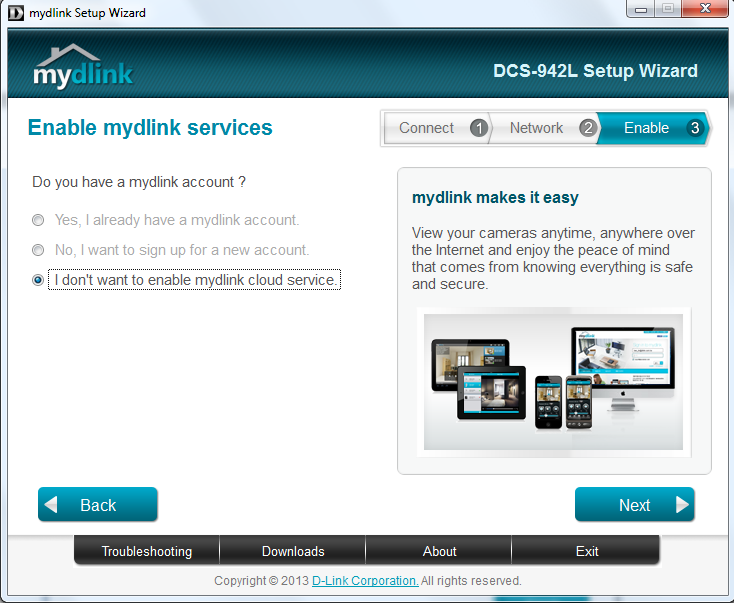 Step 8: In order to use the cloud features of your camera, you will need to add it to your mydlink account. 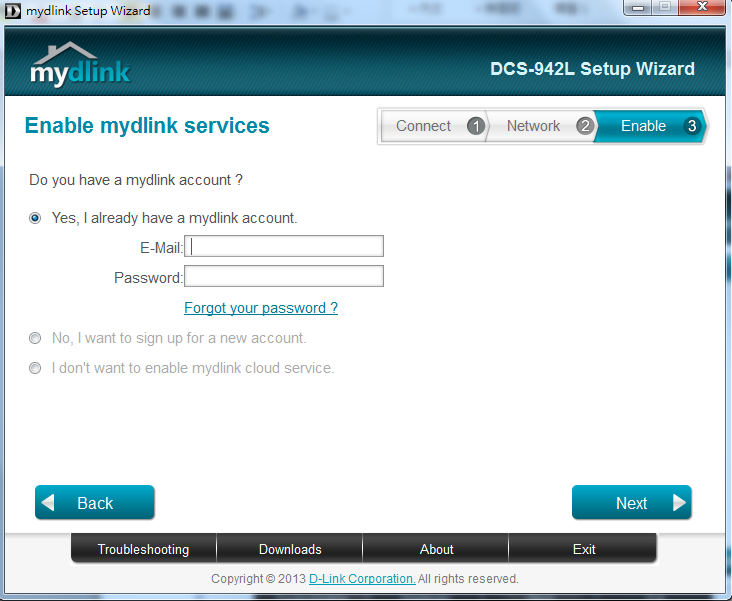 If you do not have a mydlink account, you can create one at this step. 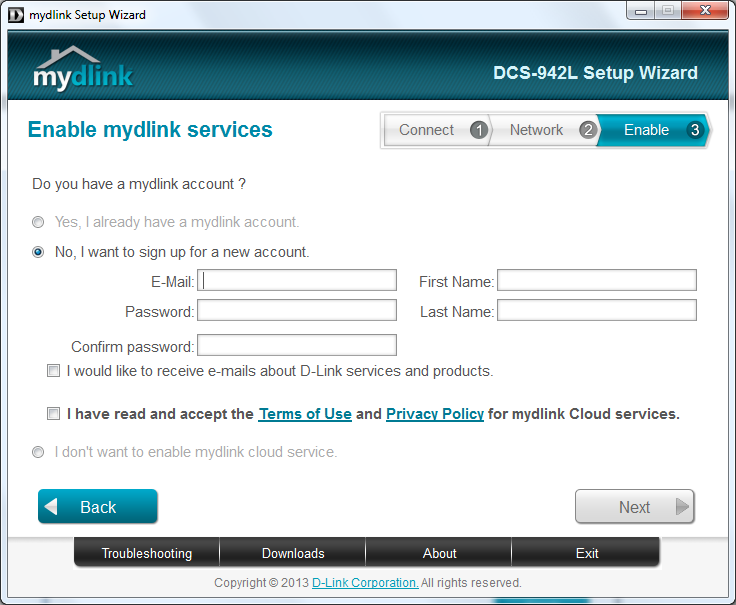 To add the DCS-942L to your existing mydlink account, select Yes, I already have a mydlink account, then enter your mydlink account username (email address) and password in the fields provided and click Next. 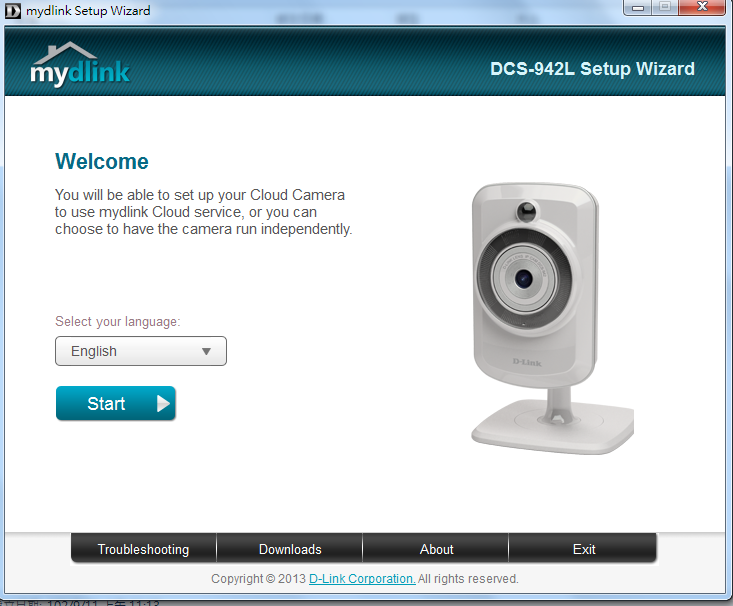 Step 10: If you selected I don’t want to enable mydlink cloud service, you will not be able to use any of the cloud services associated with your camera. Click Next to continue. Step 11: Setup is complete. 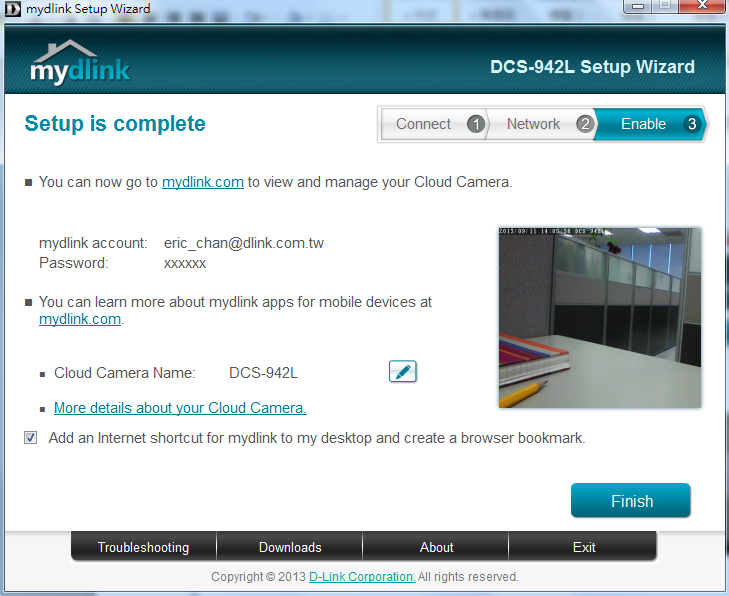 A summary page with display your camera’s setup details, as well as your mydlink account information. Click Finish.